Antique - Wm. Rogers Company, Silverplated Coffee/Tea Service in the Evandale Pattern - Manufactured between 1878 and 1893 - Totaling (5) Pieces including Lids. This Wm. Rogers "Evandale" Silverplate Coffee/Tea Service has the #1101, #1103 and #1104 Marks on the Bottoms of Pieces. We are offering the Coffee/Tea Pot w/Lid, Sugar Bowl w/lid and Creamer. These are all Pieces from the late 1800's, and are in Great Clean Condition. This Wm. 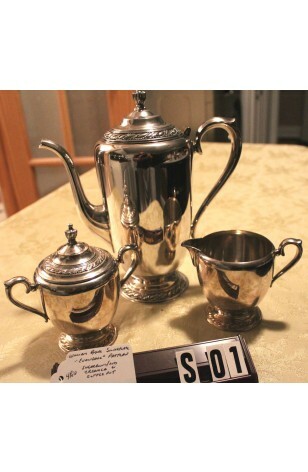 Rogers "Evandale" Silverplate Coffee/Tea Service has the #1101, #1103 and #1104 Marks on the Bottoms of Pieces. We are offering the Coffee/Tea Pot w/Lid, Sugar Bowl w/lid and Creamer. These are all Pieces from the late 1800's, and are in Very Good Resale and Clean Condition for their age.